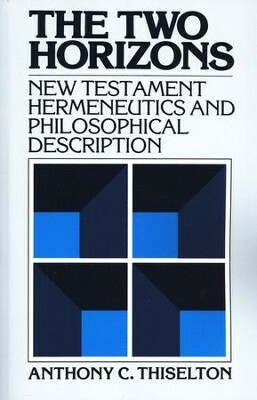 For advanced students of hermeneutics as well as philosophy, Anthony Thiselton's monumental The Two Horizons: New Testament Hermeneutics and Philosophical Description brings an exceedingly thorough and masterful grasp of the issues and literature to the table. Thiselton pays special attention to the work of Heidegger, Bultmann, Gadamer, and Wittgenstein. His thoroughness, fairness, and lucidity make this book the standard reference in the field. 484 pages, softcover, Eerdmans. I'm the author/artist and I want to review The Two Horizons.